Boil the potatoes for 20 minutes adding the spring onions to the pan 5 minutes before the end of cooking. When the potatoes have been cooking for 10 minutes add half the oil to a frying pan, brushing the remaining oil over the steaks. Season with pepper. Add the steak to the pan. Cook for 6 minutes turning every minute, less or more cooking time dependent on preference. At the same time put the broccoli on to start cooking. Drain the potatoes add the parsley and milk and mash well. 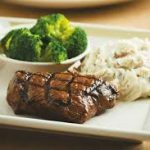 Share the mash and broccoli out evenly between two plates and serve the steaks. Put butternut squash, peppers and onion into a large roasting tin. Add the oil, toss to coat and roast for 30-35 minutes. 10 minutes before the vegetables are ready cook the tagliatelle in a sauce pan of boiling water for 8-10 minutes, pare the courgette into strips using a potato peeler add these to the tagliatelle and cook for a further 2-3 minutes. Drain the pasta and courgette and return to the sauce pan, stir in the pesto and vegetables, serve into bowls and sprinkle the cheese on top.